My honey and I aren’t big on lavish expenditures on Valentine’s Day. Usually, we spend it at home with just a few decadent treats like dark chocolate and champagne ~ a thoughtful card with a sweet sentiment is always exchanged. 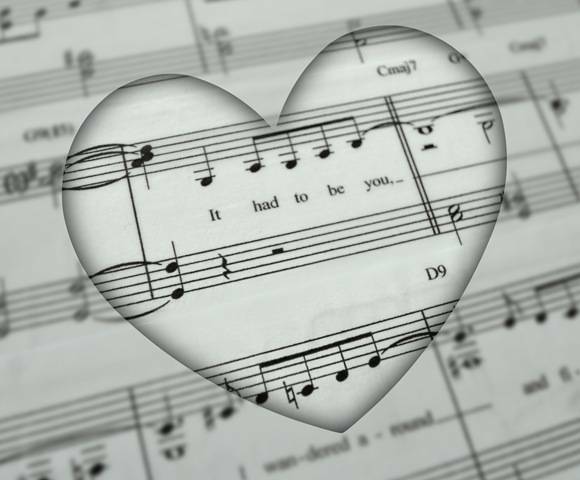 For the longest time, I’ve been wanting to craft something with the sheet music from our wedding song, but couldn’t decide what to do. A card? A picture frame mat? Then it came to me a few days ago! How about something sentimental we could actually use? A decoupage tray! 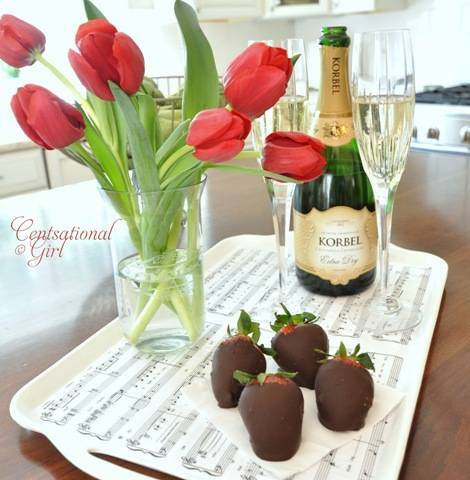 Perfect for serving chocolates and bubbly today . .
We’ve been married over 11 years, and our wedding song was Harry’s version of ‘It Had to Be You’. It’s still one of our all time favorites. Sing to me darling, sing to me! I started with an old melamine tray with a floral pattern I’ve had for years but wasn’t using. 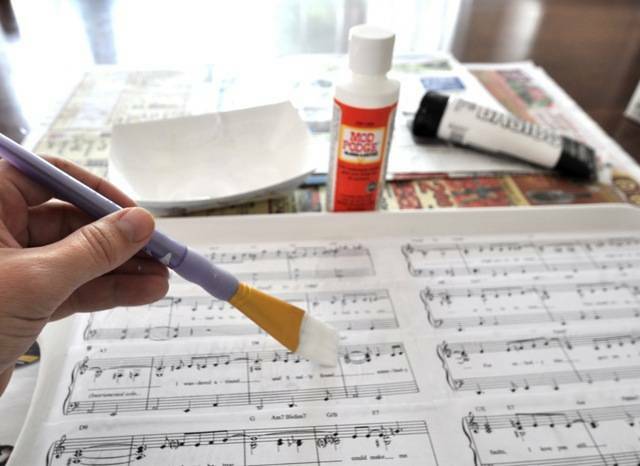 I applied one coat of primer to the entire surface, then a quick coat of white paint to the edges (where the paper would not cover the surface) to coordinate with the color of the sheet music background. Next, I snagged the pages of sheet music from my stash. 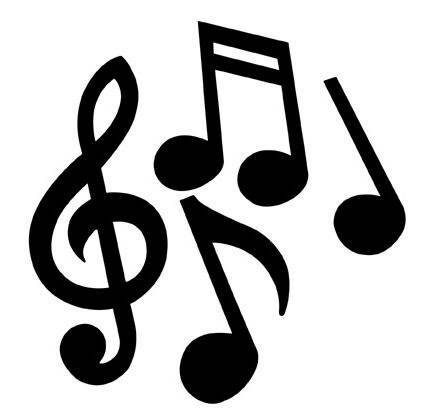 You can find the music for most songs online, simply print at home on your printer. Knowing I’d never fit all three pages, I cut the excerpts from the stanzas into strips. Then I laid out the design on the tray to get an idea of where the strips of sheet music would go. You could use this same idea for a favorite poem, lullaby, quote, whatever ! 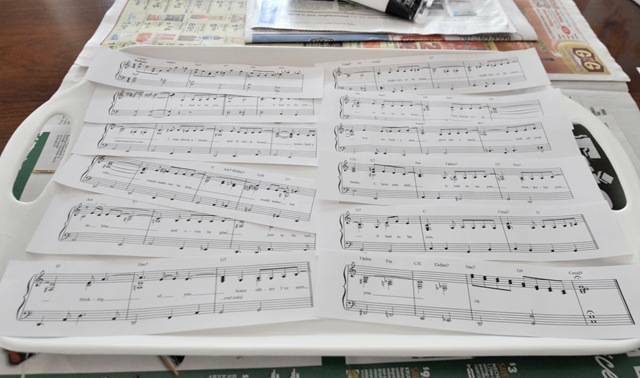 I applied a thin layer of Mod Podge to the tray, then attached the sheet music on top one strip at a time. Bubbles happen, so I carefully smoothed them with a dry finger. Finally, I applied 2 extra layers of Mod Podge to the top to seal and protect, allowing to dry between coats. We’re soooo sentimental, but wedding day reminders sure keep the romance alive! A large framed print of our wedding day is displayed proudly above my hub’s dresser, and now our wedding song holds his accessories. For the rest of the year, the tray will hold coins, watches, eyeglasses, etc. for my Mister. 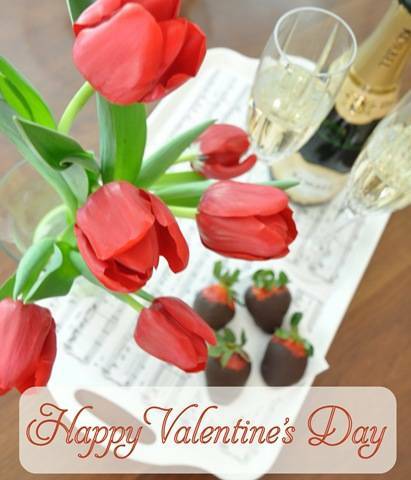 But today, we’ll be celebrating by serving up some bubbly and savoring some homemade chocolate covered strawberries . . .
‘It had to be you . . it had to be you . . . I wandered around and finally found the somebody who . . .’. what a sweet idea. I’ve haven’t decopauged anything since I was about 9 and I have no idea why. I feel like going to Goodwill and finding something ugly to love on and make beautiful with decopauge. your tray looks beautiful. Such a sweet idea. Happy Valentine’s Day! That’s really sweet! And I love that you found a way to use it everyday. Well, you just helped me decide what to switch Pandora on to. :) Love the Harry! aw! i love this idea! great valentine or anniversary gift! I love this idea! Sentimental but not tacky! :) Enjoy your day! That’s a really lovely gift. Well done! What a sweet idea. I really love the vignette below the wedding picture. Happy Valentine’s Day. So crafty. No wonder women of all ages love you. Your man is a lucky guy! Enjoy your day together! 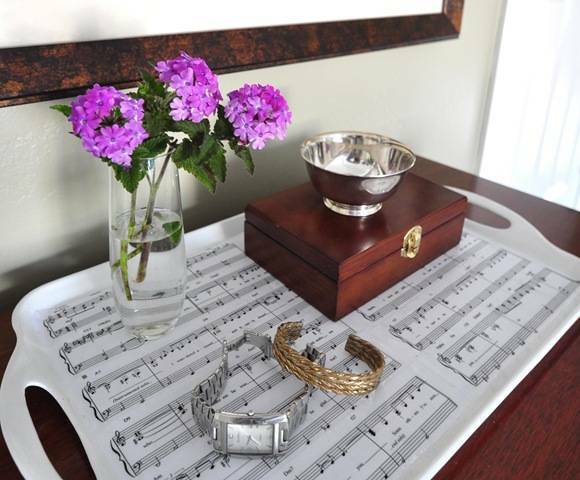 I love sheet music and this is such a great way to incorporate music into your decor. Love it!! What a great idea! I love useful things with meaning – and it’s pretty to boot. That song is the best! What an amazing idea!! I don’t do Valentine’s Day, but this is brilliant! I think I may post about this if you don’t mind…. That is adorable, and I love that you can use it year-round on the dresser too! That wedding photo is gorgeous. My husband and I generally don’t do anything extravagant for Valentine’s (it is a greeting card holiday, afterall) but I am a sucker for chocolate covered strawberries. Love how your tray turned out. The personal meaning behind it makes it even more special. That is so sweet and sentimental. I’m the same way, I love little reminders like this!!! Thanks for the idea, Kate! What a great idea! I haven’t used Mod Podge for years either, although I did buy a bottle not long ago. Now I have ideas swimming in my head. LOL! Thanks for the tut! That is such a sweet idea! It looks so beautiful. I’ve been trying to think of ways to incorporate sentimental wedding things in our home without being too sappy, so this is a great idea! That is such a sweet idea, and it’s so beautiful! 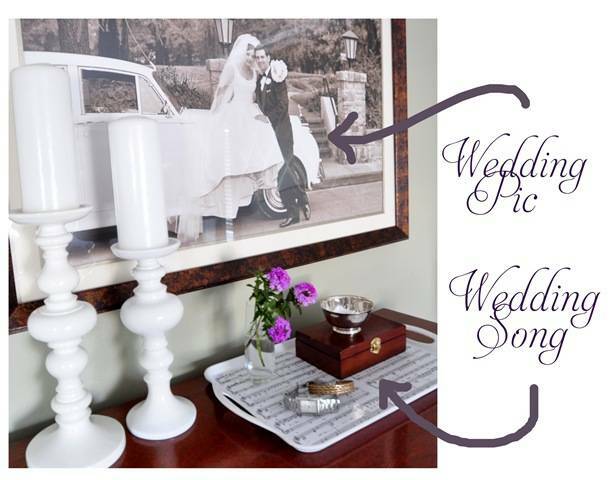 I’ve been trying to think of ways to incorporate wedding momentos into our home without seeming too sappy, so this is a great idea! Great idea. That was our wedding song also. I just may need to do this project. Wonderfully cute idea! If you knew, before-hand, what song someone was going to have at their wedding, it could even make a great wedding gift (or anniversary)! I love this idea. So sweet! Wishing you a very happy Valentine’s Day my dear! that’s absolutely perfect! and what a perfect place for it your home. Kate!- I love the tray!! That was our wedding song too! We’ve been married 7 1/2 years! Happy Valentine’s Day!! This is lovely! I love sentimental ideas. This is the perfect Valentine’s Day gift. I may have to do this for our upcoming anniversary. Your wedding photo is beautiful! Happy Valentine’s Day, Kate! I love this idea!!!! We are coming up on our 5 year anni, and this will be a perfect gift, without breaking the bank, as requested by the hubby. Thanks!!! And Happy Vday! Very sweet! I have yet to hang (or print, for that matter) a single wedding picture. Shame on me! I love this idea! I just got married this past year and our song was Better Together by Jack Johnson. I think I will steal this idea for our 1 year ann and arrange desserts for fondue (our fave romantic evening in) on it! Thanks!! Awww! That’s my wedding song too! Great idea. Love this idea and your wedding pic is just gorgeous! Very romantic and beautiful. Love it! What a cute idea! Happy Valentine’s Day! Lo-ver-lly, Kate! Celebrating our 44th Valentines day, and 43 years of marriage this anniversary!I would love to do this for our two sons and their sweet wives for anniversary gifts as someone above commented… I thinks it’s a very thoughtful and sweet gift idea! Did you save some yummy pralines to share today? Very sweet way to bring some sentiment and romance into your home everyday! And I want one of those yummy strawberries :). Happy Valentine’s Day Kate! Very inspiring! I think I might have to make something with my wedding song, too! I love personal touches like this. Thank you for sharing this idea! Aw what a lovely idea. And I love Harry Connick, Jr., and his version of that song! Very sweet. So creative! Love that! Those strawberries look SOOOOOOOO GOOD! This is one of the best Valentine’s Day ideas I’ve ever seen. Bringing Harry into the mix? Brilliant. I love that he gives a shot-out to Jill (his wife) and the end of the song. Unbelievable, awesomeness. Every man would love that. Aww, happy Valentine’s Day!!! That is such a sweet project! Completely genius and oh so sweet!!! Hope it was a great day for you two lovebirds!! SO clever- and SO sweet! Love that tray! You are so talented! What a brilliant idea! Maybe I will do that for our anniversary! So creative! So sweet! Thanks for sharing all your DIY projects! Happy Valentine’s Day! Umm.. I don’t even know where to begin on this post. 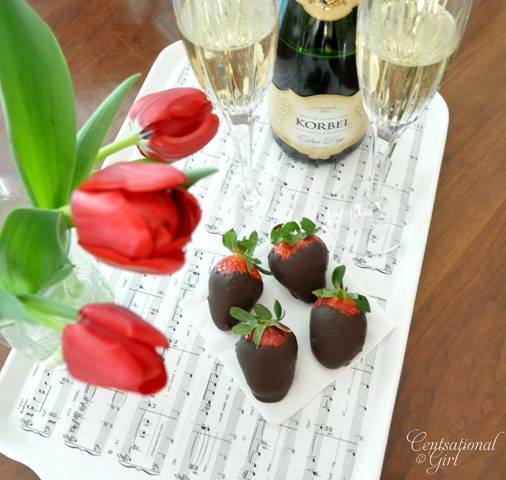 Lovely sheet music, awesome song, gorgeous wedding picture, champagne, strawberries, chocolate, flowers…! You really outdid yourself on this one gal! Fantastic idea! It looks so well done! I also love your gorgeous wedding photograph. I’ve been meaning to blow up a wedding picture for quite some time now. I absolutely love the large scale size of yours! Love it! We used the same song at our wedding 13 years ago. Gotta love Harry :) Thanks for sharing and ALWAYS inspiring me!! This was also my wedding song (from almost 17 years ago!) We are huge HC fans, went with some friends to see him when we were in college. I think we were the only ones tailgating the concert! Beautiful idea! Oh, and I also picked up some tulips the other day, and the lady at the store told me to put a penny in with my flowers, that they’d stay standing up. I’ll be darned if it’s not 4 days later and only one flower has drooped! Enjoy Valentines Day….. This is such a GREAT (!!) idea :) I can’t wait to try it. It’ll go perfectly in our house, which is always FULL of music! Thanks for sharing, these are great how to tips for a first timer. I adore your wedding photo! 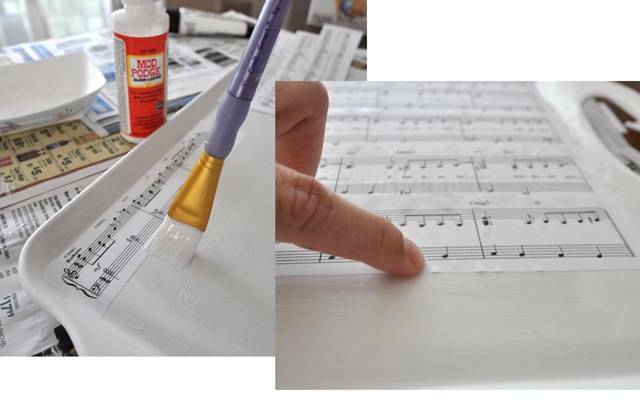 Making something meaningful from your wedding music was a great idea- I love it when crafts hold special memories! Kate! 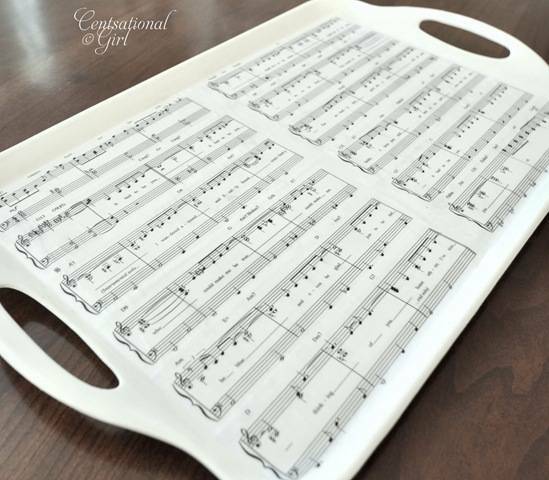 I love this tray – so awesome. And that photo of you and your hubby is gorgeous! Aww! I love this! I just did a quick search for sheet music for my wedding song (I’ll Be -Edwin McCain) and I found some! Thanks! I’ll be using it on our invitations to our vow renewal this summer!! :) So excited! Thanks so much Kate! I love this. You always have the best ideas! Such a great tutorial! Thanks for sharing. very romantic! i love modpodge! Love this idea. I am going to replicate it. 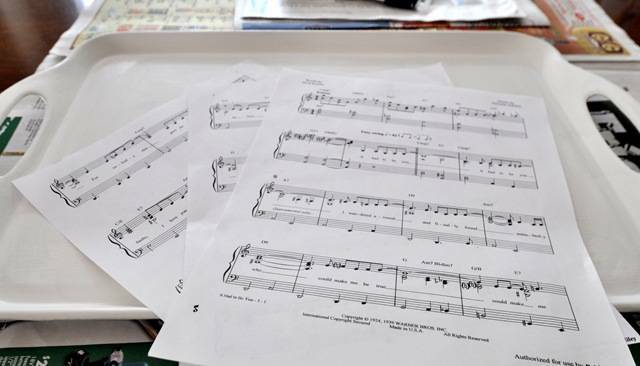 Except that for valentines day I did the candles with the sheet music of our song, so it might be overkill if I put our song all around our house? What an awesome idea!! I am working on transforming a dresser right now. I have been trying to come up with cute decor for the top and a tray similar would be perfect! I loved your pictures too!! Great post!! I’m a new fan – thankyou for this great blog – I’m really loving it. I live in Australia and have been unable to source MOD PODGE which I’ve read about here and in a few other US sites. Any idea for alternative products which may serve the purpose? I can’t figure out actually what it IS other than a sealer?? Love it! I’ve really been wanting to do a project with Mod Podge! Thanks for the inspiration! I’d love for you to visit me at http://coolhomecreations.blogspot.com! this is just lovely! We framed our wedding song and it sits amongst our gallery wall of wedding and engagmenent photos. I love using memories as art or decor! It adds so much more meaning! Great tutorial and a beautiful tray. How did you do the heart magnifier. Is that a special program on the computer? WOW! what a great idea…totally going to recreate this!!! I Absolutely love this! I can’t wait to try it out! Thank you! I’m so glad you posted this! 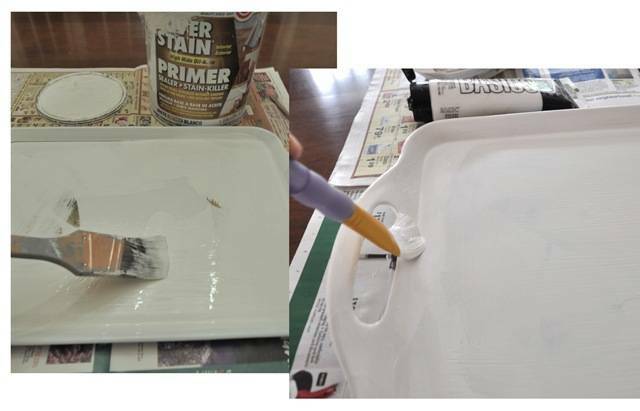 I have a tray that I’m about to redo with some paper and I was wondering the best product to use. Looks great! What a neat idea! We had the same wedding song…except my sister sang it. Which was pretty darned cool. How romantic — what a fabulous idea! I just Stumbled Upon this (literally on SU) and am in LOVE!! This is SOO fantastic!! Such a great idea!! What a pretty tray. I love the sentiment behind it too. Nice! Dropping by from How To’s Day. Hope you’ll come see the informal picture wall How To I did for DD2. Such a clever idea! Completely sweet and so romantic! The choclate dipped strawberries looks too yummy! It turned out beautifully….. and I ADORE sentimentality, so it’s right up my alley! Happy Valentine’s Day…. a smidgy late. Kate, that is so adorable. I just love it. Congratulations! I love receiving your blog and spend hours on all the links.